Since the origins of life, evolution has been driven by chance and natural selection. Today, we wrest control from chance and enter the age of genome engineering. The last decade has ushered in biotechnological breakthroughs that now allow us to edit and rewrite the genetic fate of all living organisms. In this free-ranging discussion, we will focus on both the technologies and the societal impacts of genome engineering. We will discuss the current state of the art--including CRISPR-based approaches--for manipulating genes for desired outcomes. We will touch on the practical implications in health, agriculture & food production, biomanufacturing, and national security. Dr. Ilya Finkelstein received his B.S. from the University of California at Berkeley, his Ph.D. in Chemistry from Stanford University and completed his training as an NIH Postdoctoral Fellow at Columbia University Medical Center. He started as a CPRIT fellow in cancer research and an assistant professor in the Department of Chemistry at UT Austin in 2012. His research aims to understand the biochemical pathways that allows cells to repair and replicate their genomes with extraordinary fidelity. 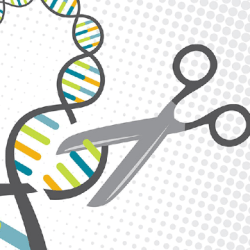 One research area focuses on CRISPR-based adaptive immunity and gene editing. Dr. Finkelstein aims to understand the biology of CRISPR systems and to use this knowledge to develop new gene editing tools. A second goal is to understanding the mechanisms of human DNA repair and how DNA repair pathways contribute to cellular longevity. He also develops new methods for high-throughput biophysics. His lab integrates microfluidics with microscopy and cell biology for biophysical studies at the single-cell and single-molecule levels. He is the author of forty five publications in top biomedical journals. Dr. Sahotra Sarkar is a professor in the departments of philosophy and integrative biology at the University of Texas at Austin. He obtained his BA from Columbia University and his MA and PhD at the University of Chicago. Before coming to Texas he taught at McGill University and held fellowships at the Wissenschaftskolleg zu Berlin, the Max Planck Institute for the History of Science at Berlin, and the Dibner Institute at MIT. Sarkar specializes in the history and philosophy of science, environmental philosophy, conservation biology, and disease ecology. He is the author of six books, including Biodiversity and Environmental Philosophy (Cambridge, 2005), Environmental Philosophy (Wiley-Blackwell, 2012), and Systematic Conservation Planning (co-authored with Chris Margules, Cambridge, 2007) and more than 200 articles, mostly in philosophy and conservation biology.